People always ask me, “Where’s the best sushi in town?” — and you should know by now, it’s very subjective. I’m not talking about simply how fresh the fish is or its taste or necessarily creativity; if you’re going to lay out a couple hundred bucks or more for sushi, it better be a full experience beyond the tastebuds. At the luxury level for sushi, you have sushi masters making their own shoyu, curing their seafood in unusual and innovative ways, and bringing new flavors unknown to many except the gastronomers with the most broad culinary adventures. I don’t simply expect mouthgasms, because any master chef can make that happen with their expertise in the science behind the art. I want the chef to connect with me, and make me connect my heart to the food s/he serves. Sushi master Keiji Nakazawa is revered for his Edomae sushi, using old-school techniques that extend the life of raw fish — a throwback to the early 19th century when fresh seafood needed to last longer. Here, though, you get some contemporary twists, and he tries to use local ingredients wherever possible to reflect his surroundings and provide exclusive flavors. Salmon smoked in banana leaves. Macadamia nut shoyu. Fish served with konbu powder or vinegar egg powder (above). Expect to try things you’ve never even heard of, like the white salmon from Alaska that’s so rare, there are only one for every thousand. The menu is seasonal, of course, so the 30-piece omakase will have changes as ingredients peak. There are two seatings per night and just 10 seats at the bar, and you can only call for reservations between 2 and 4 p.m. each day. If you can’t get a live body, leave a message, since the staff said the phone rings nonstop during that little window of time. A credit card must be provided, and you will be charged a 50 percent cancellation fee if you cancel on the day of the reservation. 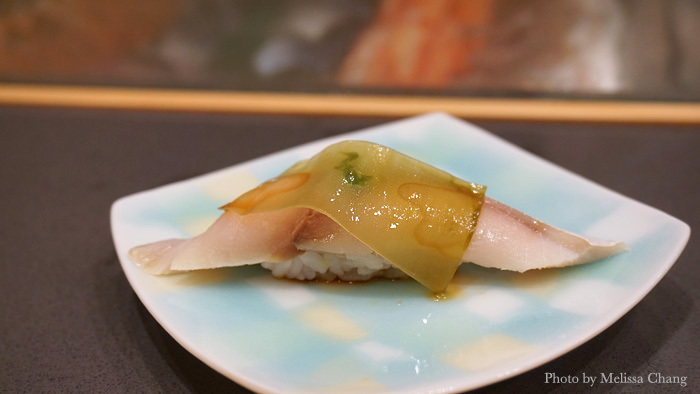 When they first opened, Sushi Ginza Onodera had three tiers of omakase. They’ve since streamlined it and made it one omakase for $250, where you get four sashimi, a couple of appetizers (grilled fish and chawanmushi), seasonal items and 10 pieces of nigiri plus dessert. Like most sushi bars of this calibre, the seafood presented will be seasonal. 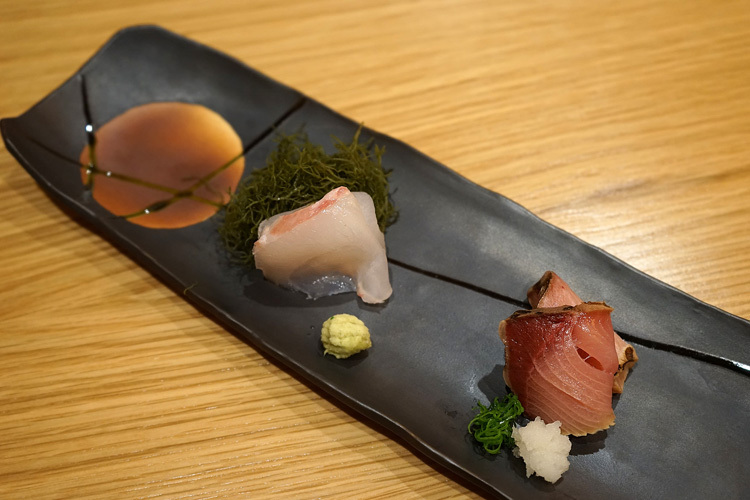 Expect to discover zen-like innovations on Edomae-style sushi, like shiitake mushroom shoyu, green tea-smoked mackerel, and shirako (sperm sac) with house-blended scallop salt. You’ll find yourself tasting your way around Japan, too, as the restaurant acquires specialties from various places: Kyoga firefly squid, Hokkaido hairy crab, Shizuoka trout and uni from wherever they can get it. 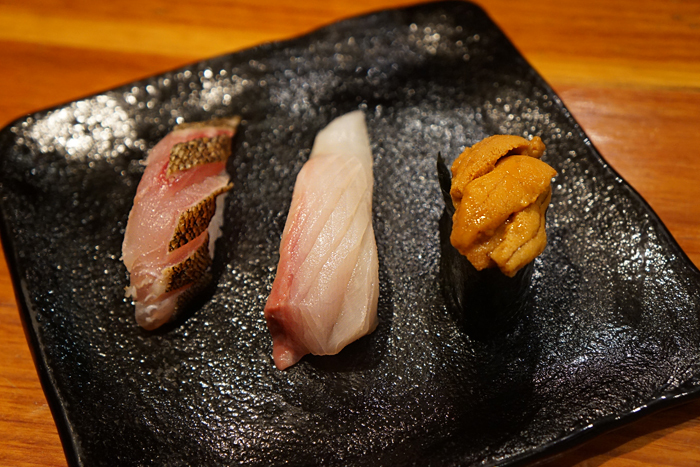 The quality of the fish is unlike most sushi bars in town, with 80 percent of it being from Japan and 20 percent local. Maru is easily one of my favorites in the luxe category. Michelin-starred sushi chef Takeshi Kawasaki delivers a full ride of emotions with dinner, sharing beautiful and unique flavors while everyone at the sushi bar becomes excited, surprised, and exhilarated with each dish (and some men, moved to tears). 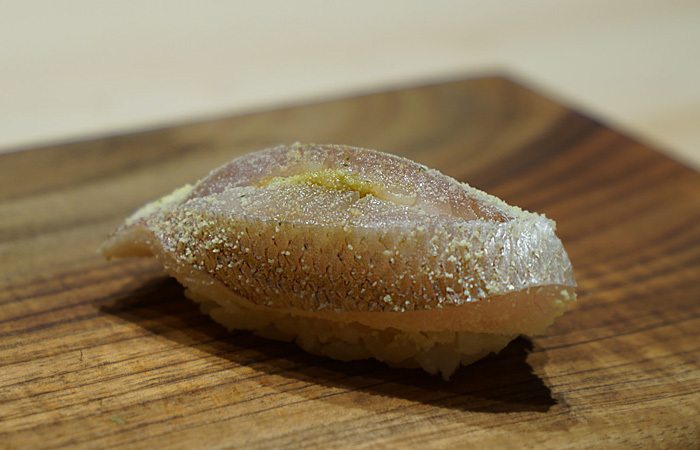 Kawasaki plays with the Edomae style sushi, creating unusual new flavors with unexpected techniques, like curing uni in konbujime and salt, or mixing a finger lime dashi to make abalone sashimi taste like it’s coming out of the ocean. My favorite, above, is mackerel topped with a special blend of green onion and ginger to impart a garlicky flavor, and topped with konbu. I don’t usually like mackerel, but I love this one. I remember the first time I put a piece of toro in my mouth at Gaku. My eyes nearly popped out of my head and I immediately made a frantic, mad grab for the plate, because I had to get another bite ASAP. 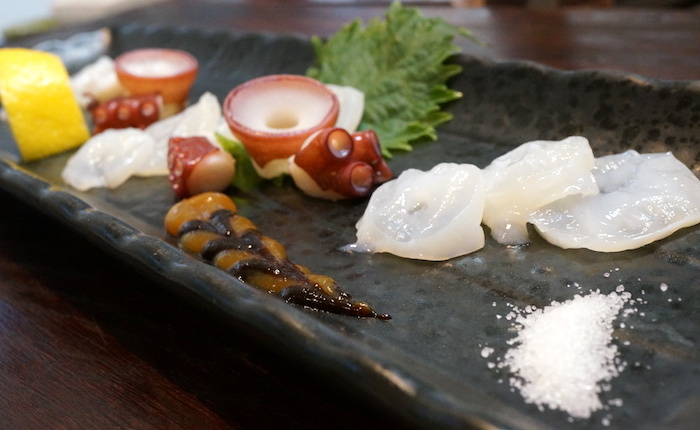 The quality of the ingredients at Gaku — whether for sushi or the izakaya plates — is always top notch, so you probably have had the same eye-popping experience if you’ve eaten there. The nigiri is divine, but you may find the occasional nontraditional ingredient (like basil) or an unusual fish from Japan thrown in for a tasty, creative twist. The omakase is in two tiers: If you just want nigiri, you get about 15 to 20 pieces for $120; the second tier, with more variety for $150, includes three appetizers, an assortment of sashimi, and about seven pieces of nigiri. They use Nanatsuboshi rice from Hokkaido, one of my favorites for its lovely, soft and fluffy texture. Sean Morris’ pick: Recently arrived from New York, Japan-born Hiroshi Sakurada transforms the okazuya Rinka Obento into an 11-seat sushi bar at night. The winner of the 2000 United States Sushi Tournament offers a generous omakase, starting with a small appetizer and house salad before working his way to some sashimi, yakimono (grilled or pan-fried dishes), and then about a dozen nigiri. Highlights may include supple hirame with a mildly acidic ponzu, shrimp with a dab of creamy mayo and briny caviar, anago (saltwater eel) with salt, tender squid with yuzu kosho (citrus pepper), and umejiso aji (horse mackerel scented with ume and shiso). You will most likely leave here content, with a swollen belly that rivals Buddha’s.